Monkey bib pattern! | Little Yarner...How I Yarn for Thee! Little Yarner…How I Yarn for Thee! ← First Entrelec project…and a baby! 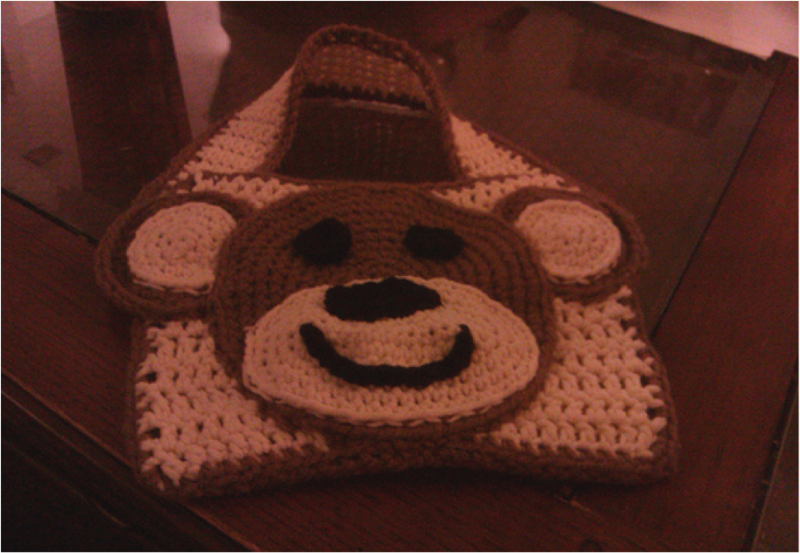 I finally got around to making a pattern for the monkey bib! Hope you enjoy it! If there’s any errors in the pattern, leave me a comment! Thanks! With Brown yarn and using Magic Loop, make 6 sc, pull tight and join with ss. Each row will be joined with a Ss to complete the circle. 2 sc in each loop. *1 sc, sc increase* repeat around. *2 sc, sc increase* repeat around. *3 sc, sc increase* repeat around. *4 sc, sc increase* repeat around. Fasten off leaving a long tail (will be used to attach ear to backing). With Almond yarn and using Magic Loop, make 6 sc, pull tight and join with Ss. This is worked in afghan style. Using black yarn and Magic loop, make 6 Hdc. Join with Ss and fasten off, leaving a long tail. Leave long tails on both sides. Make the same border on the strap as you did with the backing. Join all the pieces according to the picture. Put the final backing on LAST, after weaving in all the ends. Join this by sewing through back loops only. ***I would like to add that the second backing is completely OPTIONAL. It’s purely aesthetic. If you weave in the ends and sew nicely, there’s really no need for it. These are adorable! I’m going to make the monkey and the frog for my niece who had a preemie. She should be going home in the next 4 to 6 weeks. That should be more than enough time fo finish these. Thank you!! thank you for the frog and monkey baby bib pattern with 3 new great grans last year and 3 new greats this year i’m looking for fast and easy patterns. these look easy! What is “Magic Loop” on the monkey bib pattern? I dont understand how to make the muzzle part. I dont get afghan style. What does that mean? It means you make the chain, turn the work, go back over the chain as usual but instead of turning, you keep going around in a circle. How did you fasten the buttons?? Depending on the size of your button holes, you either use yarn and a yarn needle, or a regular needle and thread. Just sew the buttons on as you would anything else, but make sure you go over at least a couple stitches in back. I prefer to make an “x” at the back for better security. This is super cute! I have been having trouble w/ the muzzle. I can’t seem to figure out your instructions. Any tips would be appreciated! You’re going to be crocheting “in the round.” Not a circle, but more like an oval. You’ll go across the line, crochet 3 in the end, and go back across the other side. Does that help? It’s like making a granny afghan. Basically you are working in a circle. So for the first round, you single crochet in the first loop, then 2 single crochet in the second (an increase) and repeat that pattern around. not sure if you will still get this but I have most of monkey bib done but like everyone I am having problems with directions on muzzle area too. As I crochet it, sees like the numbers are off. After doing the 3 at end then continuing across bottom, then 2 at other end, join, sc increase, then “9” sc across, then increase in next 3, the 9 comes short of the next end. It ends up forming a cuplike muzzle as I continue this way. Is it suppose to do that rather then lay flat? Baby shower in 2 days! Help!!! Yes. It is supposed to be cup like instead of laying flat.